Compare simple harmonic motion with uniform circular motion. There is an easy way to produce simple harmonic motion by using uniform circular motion. Figure 2 shows one way of using this method. A ball is attached to a uniformly rotating vertical turntable, and its shadow is projected on the floor as shown. The shadow undergoes simple harmonic motion. Hooke’s law usually describes uniform circular motions ( constant) rather than systems that have large visible displacements. So observing the projection of uniform circular motion, as in Figure 2, is often easier than observing a precise large-scale simple harmonic oscillator. If studied in sufficient depth, simple harmonic motion produced in this manner can give considerable insight into many aspects of oscillations and waves and is very useful mathematically. In our brief treatment, we shall indicate some of the major features of this relationship and how they might be useful. Figure 2. The shadow of a ball rotating at constant angular velocity ω on a turntable goes back and forth in precise simple harmonic motion. 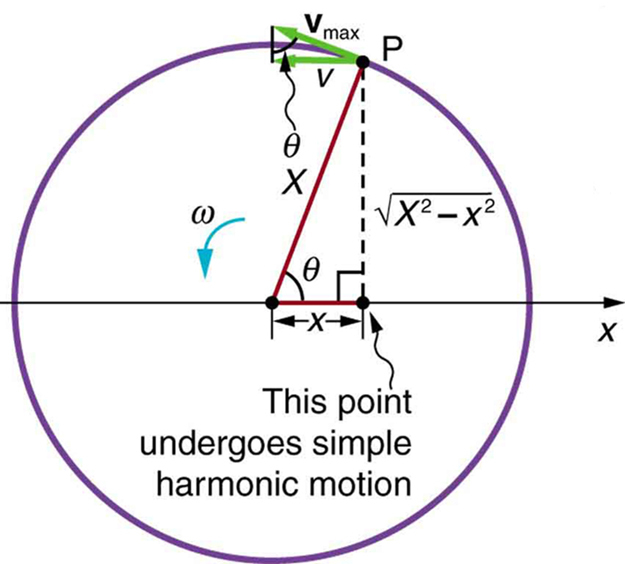 Figure 3 shows the basic relationship between uniform circular motion and simple harmonic motion. 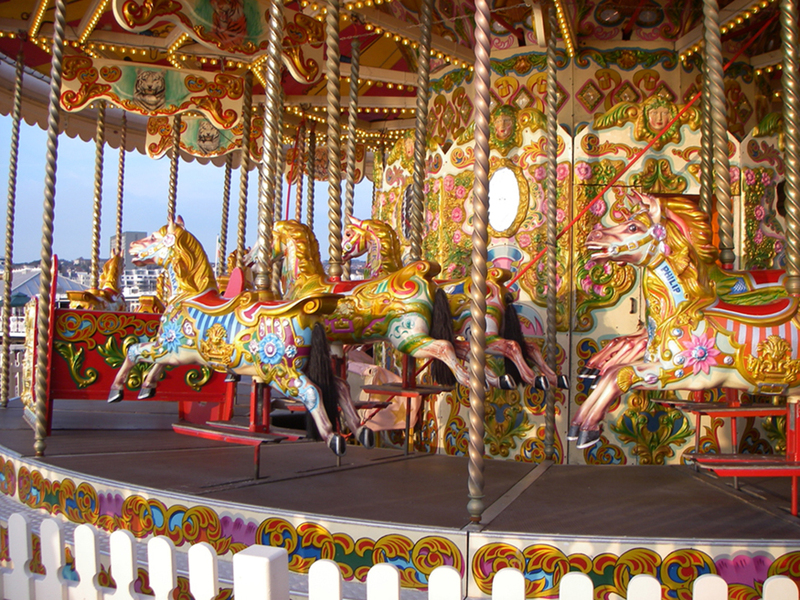 The point P travels around the circle at constant angular velocity The point P is analogous to an object on the merry-go-round. The projection of the position of P onto a fixed axis undergoes simple harmonic motion and is analogous to the shadow of the object. At the time shown in the figure, the projection has position and moves to the left with velocity The velocity of the point P around the circle equals The projection of on the -axis is the velocity of the simple harmonic motion along the -axis. Figure 3. A point P moving on a circular path with a constant angular velocity ω is undergoing uniform circular motion. 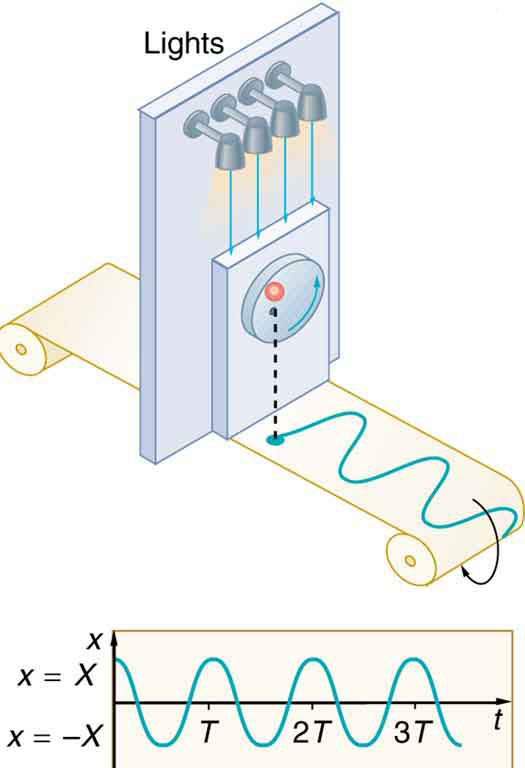 Its projection on the x-axis undergoes simple harmonic motion. Also shown is the velocity of this point around the circle, v̄max, and its projection, which is v. Note that these velocities form a similar triangle to the displacement triangle. This expression is the same one we had for the position of a simple harmonic oscillator in Chapter 16.3 Simple Harmonic Motion: A Special Periodic Motion. If we make a graph of position versus time as in Figure 4, we see again the wavelike character (typical of simple harmonic motion) of the projection of uniform circular motion onto the -axis. Figure 4. The position of the projection of uniform circular motion performs simple harmonic motion, as this wavelike graph of x versus t indicates. This expression for the speed of a simple harmonic oscillator is exactly the same as the equation obtained from conservation of energy considerations in Chapter 16.5 Energy and the Simple Harmonic Oscillator.You can begin to see that it is possible to get all of the characteristics of simple harmonic motion from an analysis of the projection of uniform circular motion. Thus, the period of the motion is the same as for a simple harmonic oscillator. We have determined the period for any simple harmonic oscillator using the relationship between uniform circular motion and simple harmonic motion. Some modules occasionally refer to the connection between uniform circular motion and simple harmonic motion. Moreover, if you carry your study of physics and its applications to greater depths, you will find this relationship useful. It can, for example, help to analyze how waves add when they are superimposed. 1: Identify an object that undergoes uniform circular motion. Describe how you could trace the simple harmonic motion of this object as a wave. A projection of uniform circular motion undergoes simple harmonic oscillation. 1: (a)What is the maximum velocity of an 85.0-kg person bouncing on a bathroom scale having a force constant of if the amplitude of the bounce is 0.200 cm? (b)What is the maximum energy stored in the spring? 2: A novelty clock has a 0.0100-kg mass object bouncing on a spring that has a force constant of 1.25 N/m. What is the maximum velocity of the object if the object bounces 3.00 cm above and below its equilibrium position? (b) How many joules of kinetic energy does the object have at its maximum velocity? 3: At what positions is the speed of a simple harmonic oscillator half its maximum? That is, what values of give where is the amplitude of the motion? 4: A ladybug sits 12.0 cm from the center of a Beatles music album spinning at 33.33 rpm. What is the maximum velocity of its shadow on the wall behind the turntable, if illuminated parallel to the record by the parallel rays of the setting Sun? 1: A record player undergoes uniform circular motion. You could attach dowel rod to one point on the outside edge of the turntable and attach a pen to the other end of the dowel. As the record player turns, the pen will move. You can drag a long piece of paper under the pen, capturing its motion as a wave. 16.6 Uniform Circular Motion and Simple Harmonic Motion by OpenStax is licensed under a Creative Commons Attribution 4.0 International License, except where otherwise noted.